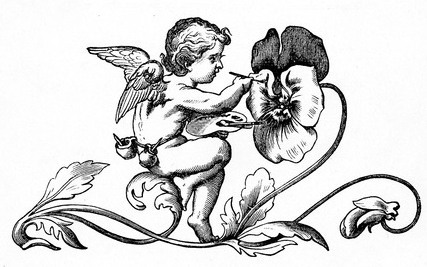 A winged cherub paints the petals of a pansy flower in this charming vintage arts and crafts image. This public domain cherub painting image is downloadable, printable and would make a perfect illustration to use when talking about painting nature. It appeared in The Beautiful Book for Little Children which was stereotyped in 1874 by C.J. Peters & So. in 1874. They did not identify an author or illustrator.